One World Music & Song..
...is a fun, interactive workshop. Hearing, seeing and playing over 40 different instruments the class will have a fun and inspiring time increasing their awareness of world folk music, cultural and religious diversities/similarities and musical history. The display of musical instruments includes Australian Didgeridoos, Bulgarian winds and Chinese harps to Egyptian percussion, Islamic trumpets and Welsh hornpipes. This package is particularly useful for religious and multicultural education. I can also be booked for a class or event focusing upon a specific religion or culture using music and story and art to bring it alive. 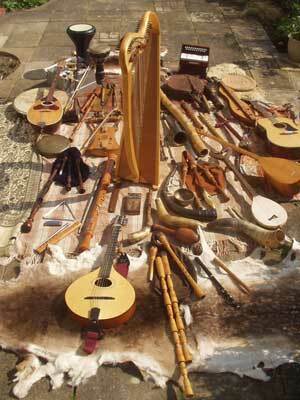 Explore the bardic arts with winds (whistles, flutes, pipes, bag pipes, recorders, shawms, didjeridoos), strings (guitar, mandolin, bouzouki, cittern, saz, crwth, welsh harp, chinese harp), percussion, song and story. The art of the bard is ancient, rooting back through time and history to this planet's earliest cultures and societies... today this vibrant tree has many flourishing branches and limbs bearing all sorts of diverse fruit and flowers. One limb that is very well established and has been growing since the tree first fruited since is that of storytelling and the embroidery and enactment of myth. Celebrating Peace, Mutual Acceptance and Community. Ask each representative to prepare a short speech on how they value water and how their faith relates to water (baptism, amritsa, cooking, blessing etc), including prayers or blessings if they wish. Ask them to bring a symbol of their religion/spirituality/belief. Then gather around a vessel of water or a pond, a stream or waterway. Introduce each representative and ask them to deliver their speech/prayers and then place their symbol next to the body of water. This results in a sharing of the many ways in which we value and respect water and the environment, creating a moment of community, peace and mutual acceptance... creating a beautiful image of all the religious and secular symbols united by water... Water that nourishes everybody and rejects nobody. This may then be followed with group activites such as litter picking from the stream or tree planting... working and celebrating together. How about a multi-faith harvest festival next harvest time? Many aspects of the environment and environmentalism can be a focus for events such as this... simplicity is a key to success.